You were laid off? Oh no! That’s awful. I’m so sorry. You know what, they never appreciated you the way you deserve. What a lousy bunch of – temporarily? Ohhhh. Huh. So, you’re not fired? Ok. Refresh my memory on this whole temporary layoff thing! Chances are, you’ve heard of temporary layoffs. Maybe you’ve wondered if this could happen to you and, if it did, what exactly that would mean. A temporary layoff is the cutting back or complete cessation of an employee’s employment with the understanding that they will be called back to their full-time position within a specified period of time. A temporarily laid off individual is still considered an employee, even if they are not working. This can mean that they are not working at all, or even simply earning less than half of their regular wages. A temporary layoff is a way mitigate economic hardship for both employer and employees. Temporary layoffs are often brought on by things like economic downturn, shortages of work and seasonal employment. Temporary layoffs are most common in union environments where collective bargaining agreements determine the parameters of a layoff such as which employees are the first to return to work. A temporary layoff allows employers to avoid severance or termination costs as long as the employee is recalled to work within 13 weeks of the layoff’s commencement. Though it would certainly be appreciated by their employees, employers have no obligation to provide notice of a layoff. Additionally, employers are not required to give termination notice until the last day of the layoff should it become clear that the layoff will have to become permanent. The parameters of temporary layoffs are set out in the Employment Standards Act (ESA). However, the ESA doesn’t give employers the right to enact them. The right to temporarily layoff an employee must be contractually stated, either in the employment contract or the collective bargaining agreement. If an employee is temporarily laid off without a provision for this in their contract, the layoff would be considered a constructive dismissal and the employee would be entitled to seek damages for wrongful dismissal. 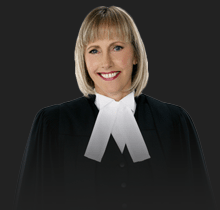 Wrongful dismissal charges may be avoided if the laid off employee is immediately recalled to their former position. Furthermore, some courts have found that employees who refuse to return to their position after a non-contractual layoff will be found to have failed in their duty to mitigate their damages. If the power to perform temporary layoffs was not in written agreement at the time of hire and an employer wishes to pursue this option, they should approach their employee with a written proposal for a temporary layoff. It is possible that the employee will choose this over termination, especially since employees can usually collect Employment Insurance benefits during a layoff. How Long Can Temporary Layoffs Last? A temporary layoff can last up to 13 weeks in a consecutive 20-week period. 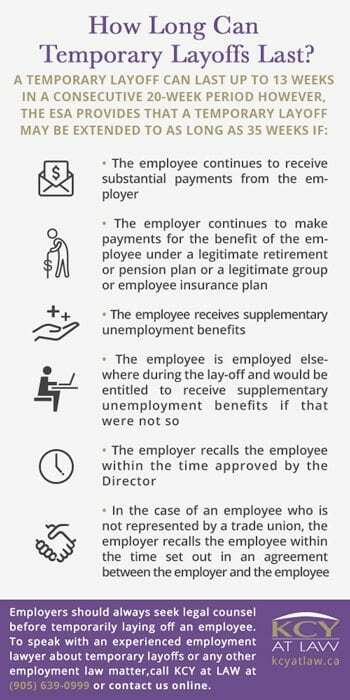 However, if a layoff exceeds this 13-week period it will become a termination at which point the employee will be entitled to termination pay in lieu of notice with the first day of the layoff becoming the date of termination. If an employee quits before a layoff is over they are not owed severance or termination packages but may still be entitled to accrued benefits such as vacation pay. Employers should always seek legal counsel before temporarily laying off an employee. 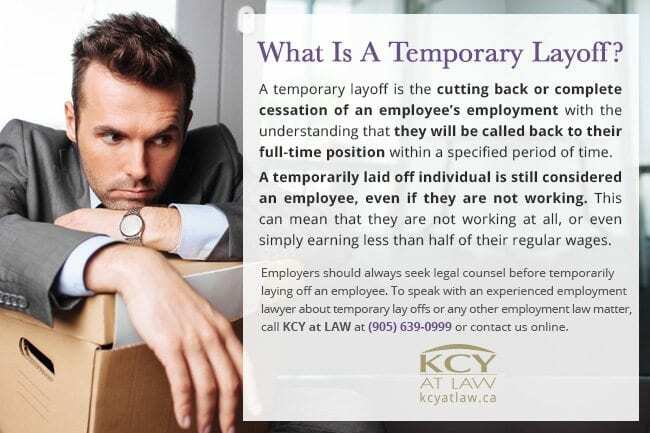 To speak with an experienced employment lawyer about temporary layoffs or any other employment law matter, call KCY at LAW at (905) 639-0999 or contact us online here.